A ZOMBIE-themed fun run through the countryside raised about £1,500 for charity. Forty-six people braved a temperature of 1C as they followed a 5km circuit along footpaths around Rotherfield Greys while being chased by a team of 26 volunteers dressed as the undead. The runners each wore velcro waistbands with four tags attached which the “zombies” had to try to pull off before the finish. The event was held in memory of Simon Priestley, 46, who died while captaining Henley Rugby Club’s fourth team the Bears during a match. It was in aid of Pursuing Independent Paths, a charity run by his friend Bill Feeney, from Henley, which helps people with learning disabilities achieve their potential. Mr Priestley’s widow Julie took part and the couple’s children Amelia, 11, and Jonty, nine, helped to organise it while wearing zombie make-up. Jonty started the race outside the Maltsters Arms pub by blowing an air horn. The “zombies” gathered on the pub patio about an hour before the start to be made up by a team of volunteers using grey, black and blue face paint as well as fake blood and “wounds” made from liquid rubber. Some also brought their own costumes including wigs, false “rotting” teeth, rubber masks and camouflage. They were split into groups and sent to one of four locations around the course, which ran along the back of St Nicholas’s Church and around the woods behind Greys Green Golf Course. Wireless speakers in the hedgerows played spooky music to add to the effect. The runners were briefed by Mr Feeney before being sent off in five waves. Most of the “zombies” hid in the trees and leapt out at them with a scream as they passed. Only a handful of runners still had any tags by the time they finished. Afterwards, the participants enjoyed drinks and hot food at Lovibonds Brewery in Greys Road, Henley, and drank a toast in memory of Mr Priestley, of Chilterns End Close, who originally came up with the idea after seeing a similar event in America, where his wife grew up. He and Mr Feeney had been friends for six years, having met as regulars at Lovibonds, and Mr Priestley always took part in the annual PIP Mountain Bike Challenge, which starts and finishes at the brewery. Mr Feeney, who ran in zombie face-paint, said: “Simon spent most of 2017 talking about it and as Christmas got nearer it became more serious. “Unfortunately it was delayed but when he passed one of the first things Julie said was that we had to make it happen. “It was very much the kind of thing Simon would have enjoyed as it was a chance to be active and have a bit of fun while raising money for PIP. He was a big supporter and always wanted us to benefit. “It was a fantastic afternoon and a fitting tribute to Simon. Including our marshals, we probably had 100 people in total and everyone had a great time. “The ‘zombies’ did a wonderful job and we’re really grateful for their contribution. It’s very touching how willing people were to help after we put a shout-out on social media. “It was absolutely freezing but it didn’t deter people, although there were quite a few comments about waiting until the spring! Personally, I thought the the cold added to the atmosphere. “Of course, there were times when it was difficult, particularly when we toasted Simon afterwards. We knew it was the kind of thing he’d have loved and I felt responsible for making sure it included all the elements he would have wanted. “There weren’t any prizes as it was the first one and we wanted to keep it simple but we’re definitely going to do it again and have a special children’s event as well. Mr Priestley, who had lived in Henley for 18 years, collapsed on the pitch at Dry Leas during a home match against High Wycombe on January 6. Despite efforts by the club physio, referee, players and paramedics to revive him, he was pronounced dead at the Royal Berkshire Hospital in Reading. The following week, the entire club came together for a memorial ceremony before the first team’s match against Tonbridge Juddians. 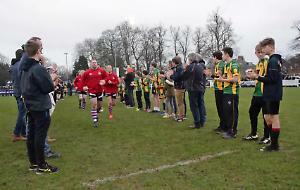 The youth teams formed a guard of honour for both teams as they walked on to the pitch. A minute’s silence and then a minute’s applause were observed before Mr Priestley’s team-mates presented his shirt to his family.